One of the more difficult challenges of aging is realizing your home may no longer safe or usable for you. Steps and elevation are generally the biggest hurdles. And usually the cost to renovate and remodel is such that it’s preferable to move. Architect John Salmen specializes in barrier-free design and spent a lot time thinking about the home that would meet his family needs as they grow older. Working with his wife, Ann Scher, they decided “to look for a run-down house in a good neighborhood that had services within walking distance to support us for the rest of our lives.” The house would be remodeled using the people-friendly principles of universal design. 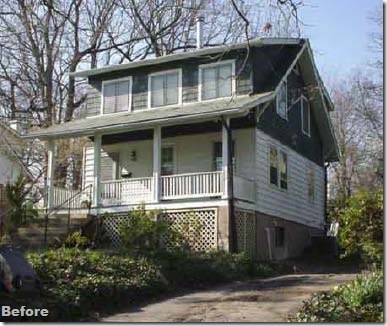 It took two years but they found the ideal house to remodel in Takoma Park, Maryland, a circa-1910 three-story house. And another year to complete the renovation and remodel which included regrading the driveway to allow for installation of a residential elevator. The elevator connects the first floor/basement to the third floor and is essential to making this design a success. Other key features include a studio/guest room on the first floor that is plumbed for a future kitchenette. 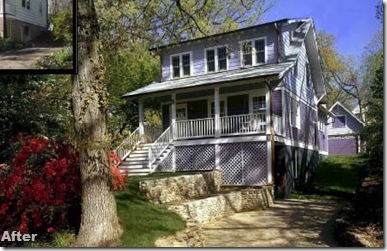 Allowing for the possibility of a parent moving in or perhaps a live-in assistant. There are no thresholds on the interior doors and no steps on the entry doors. Dual height counters and 36-inch wide doors throughout allow for wheelchair access if needed. Click here to begin the house tour with the universally designed kitchen.